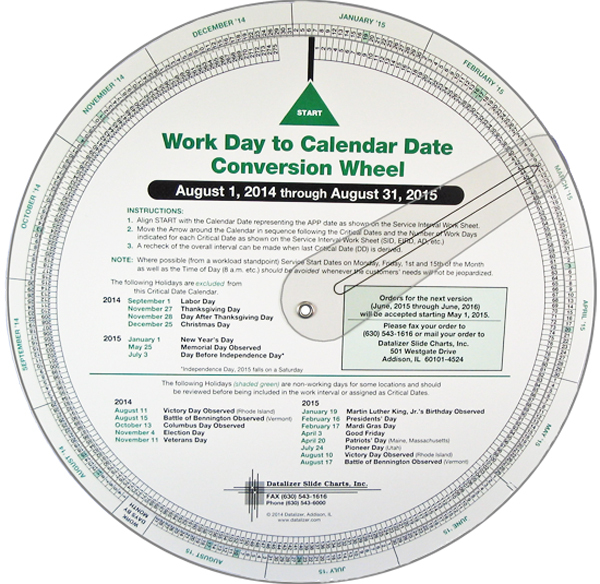 This date wheel automatically deletes major holidays and weekends for critical date planning and calculating. THIS CALENDAR IS GOOD FOR 1 YEAR ONLY! A new version is issued every 9 months. This allows for a 3 month overlap period which eliminates the need for 2 different wheels during the last 3 months. Materials: Two dials .024 coated cover stock with a clear plastic cursor. Imprinting is not available on this stock item. "Easy to use and accurate." Date needed? Anything else? Have you purchased previous versions of this chart? This item is pre-produced and ready to ship. Imprinting is not available on this stock item.